The Sheldonian Theatre in Oxford has been named the most uncomfortable arts venue in the UK by listeners to Radio 4's Front Row. The 350-year-old building designed by Sir Christopher Wren is one of Oxford's main classical concert halls. 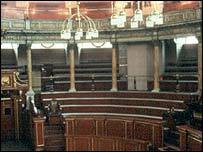 One listener said: "Hardy souls perching on benches in the upper tiers deserve a medal for endurance." But theatre manager Maggie Burge said the building was not purpose-built and the atmosphere was the main draw. The Sheldonian is part of Oxford University and was originally designed by Wren for degree ceremonies. It can hold 800 people for concerts. "I'm not surprised about the result - the Sheldonian was never built as a theatre for people to sit in for two hours," said Ms Burge. "But to hear classical music in here is something else," she said. In 1994, the theatre was described by the European Commission as "one of the architectural jewels of Oxford". For one regular visitor to the theatre though, it was too much to bear. "My bottom and back cannot take the pain and strain anymore," he said. In general, the worst venues voted for were opera houses, including the Royal Opera House and the English National Opera, and West End theatres. Many listeners also responded with their favourite venues - London's Barbican scored highly, along with the Birmingham Repertory. 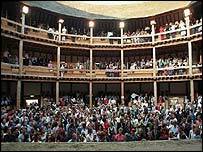 Shakespeare's Globe Theatre on London's South Bank also received some positive votes - despite the fact that a trip there involves either standing in the pit in front of the stage or sitting on hard wooden benches. The Electric cinema in London received mixed comments - although it was praised for its spacious and comfortable seats, one listener felt it lacked authenticity because "an arts cinema should be more shabby." For the full story listen to Front Row on Radio 4 at 1915 on Friday.